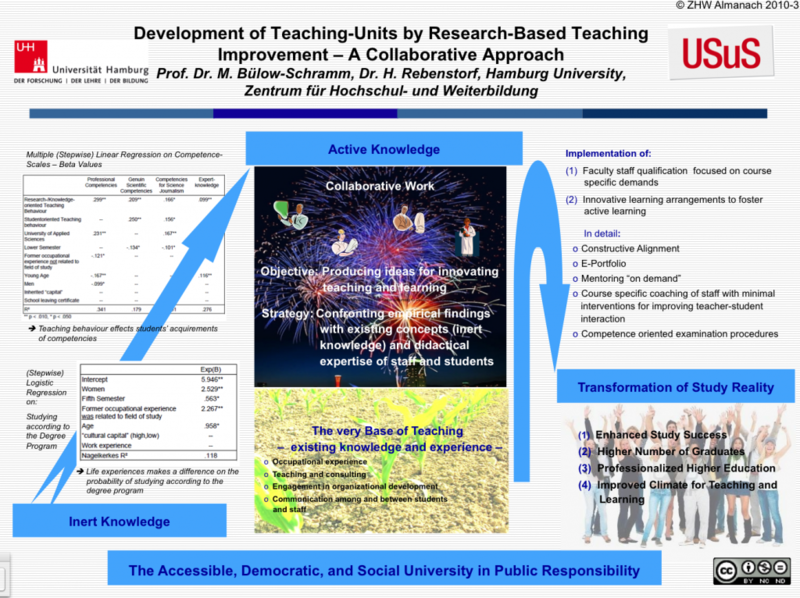 Abstract: For an effective development of teaching-units it is down-right fruitful and profitable to link concrete measures in faculty and instructional development with research that considers the whole contextual framing of higher education. European countries are facing the problem of reconstructing the BA/BSc-Programs in a way, that they serve foremost students’ demands. However, they also have to conform to the objectives of the Bologna-Reform as well as to subject-specific. On this basic principle and based upon empirical findings from our own survey custom-made innovations in instructional development can be tested, assessed and used for designing study-programs. Conceptual Framework: Within four BA/BSc-programmes at four universities in Germany determinants of study success are empirically explored. For phrasing our research question we refer to theoretical and empi-rical findings on social inequality and educational upward mobility. The conceptual design of didactical interventions is based upon those studies which initiated the shift from teaching to learning and showed the interrelation of learning outcomes and teaching methods. We feel committed to the conclusions drawn from these findings for the prac-tice of teaching and learning, i.e. to develop participatory teaching approaches, which encourage and enforce individual learning of all students. Simultaneously we apply these findings to our own research: knowledge and awareness alone do not necessarily produce changes in people’s attitudes and behaviours. Our findings also could become „dull knowledge“, if the transfer into practice does not work. This is why, in addition to the quantitative and qualitative data gathering, teaching in each participating university and BA/BSc-program will be subject to intervention. By doing so, we want to identify the specific starting points for effective teaching and learning and to qualify and motivate the local faculty for non-traditional teaching. The aim is to enhance study success and to make the course of studies more satisfactory for the students as well as for the universities and the labour market. As our findings show, the study structures differ greatly between disciplines despite the uniform demands from the Bologna-Communi-qués. The differences can be found in study guidelines, the exami-nation regulations, and in the everyday course of studies. For these differences the distinction between university types seems to be im-portant as well as the disciplines, which cause the internal differen-tiation. The latter seems to be the more crucial. This is in a way stun-ning, however, it conforms with findings of higher education research showing that in Germany the institutional differentiation is less impor-tant than, e.g., in Great Britain. We examine how these differences come along with diverse differentiations within universities and within institutions, and if the diverse student populations develop different views on their studies and cope differently with their study demands. This will lead us to empirically based information about study beha-viour according to different individual study conditions. Another focus lies on the didactical study arrangements and the role it plays for the students’ view on their studies. Information on this subject we do not only gather by systematic questioning but also by didactical interventions. On behalf of this we design specific measures for each BA/BSc-programme. We strive for a middle range development-project in higher education didactics that will accompany continuously, with growing complexity the arrangement of the BA programmes. We appreciate a variety of collaborative relations to faculty, students, and to local instructors in higher education didactics. Heublein, U. et al., 2009, Ursachen des Studienabbruchs in Bachelor- und herkömmlichen Studiengängen, Hannover.